Since flatpicking guitar players typically perform and record in the ensemble setting, flatpicking solos are usually arranged in the context of other instruments providing rhythmic and harmonic accompaniment. While those single note linear solos sound great when played in the context of an ensemble, they can sound quite sparse and lacking in texture and dimension if the flatpicking guitar player is playing alone. More and more, flatpickers are exploring solo performance. Well known flatpickers like Dan Crary, Beppe Gambetta, Steve Kaufman, David Grier, Robert Bowlin and Orrin Star, and others, are performing and/or recording as solo acts. These players are adding techniques such as open ringing notes, chordal strums, chord-melody style phrases, floating licks, drone notes, and crosspicking to their linear lines in order to add a full texture and broad dimension to solo performances. But still, written material arranged for the solo player is not so easy to find. In this book Italian flatpicker Roberto Dalla Vecchia explores ten standard flatpicking fiddle tunes and has arranged them for solo flatpicking guitar. Roberto is a talented flatpicker who is comfortable performing and recording as a solo act. His arrangements here are creative and interesting. 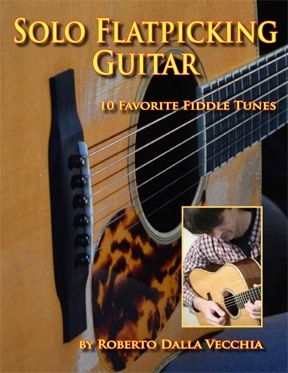 I predict that intermediate and advanced flatpicking guitar players will enjoy learning these arrangements and adding Roberto’s ideas to their own arrangements of these popular tunes. As the editor and publisher of Flatpicking Guitar Magazine, I’ve received numerous requests for arrangements of fiddle tunes for the solo flatpicking guitar player. Many of our readers spend a lot of time playing for themselves or family members at home with no accompaniment. As stated above, fiddle tune solos on the guitar that are arranged and written for the ensemble player sound very sparse in the context of playing solo. This book provides an answer to those players who are looking for written fiddle tune arrangements for solo flatpicking guitar.